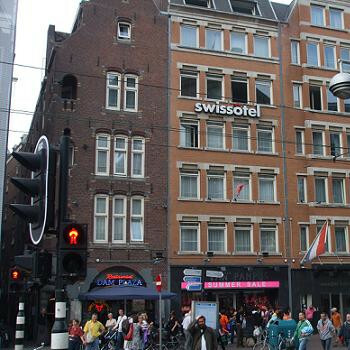 The centrally located Swissotel Amsterdam is a 4 star hotel situated at Dam Square, a short walk from Amsterdam Central Station. Most of the major attractions and sites are within walking distance and the Schiphol Airport is just 20km away. We arrived too early to check in due to an early flight, but the reception staff were very happy to help us. They did all the paperwork there and then and stored our bags, so all we had to do later was collect the room key. The room was a superior room at the back of the building, so no view onto Dam square, but also no noise from the square or the funfair that was right on the corner in front of the NeueKerk and Royal Palace, so we weren't worried about that. The size was adequate, bigger than some rooms I've seen in Amsterdam, and the bed, a huge Kingsize was very comfortable. We had a full minibar with snacks, tea and hot chocolate facilities and a proper coffe machine. There was a safe and an iron and ironing board in the wardrobe and adequate hanging space for a 3 night stay. The room also had facilities for wireless or wired broadband, but we did not make us of these. The bathroom was spotless, done out in granite and had a speaker wired into the TV so you could listen in while in the bathroom. Both bath and shower were absolutely fine, and the plug didn't leak which I have seen on other hotels in the past. Television had about 20 channels, mainly dutch but it also had BBC1,2 and world, and CNN in english, and some other language stations too (I definitely heard french, and think some german too). Breakfast was lovely, buffet style with everything yoy might want for breakfast, pastries, cereals, bacon etc, variou fish, yoghurts etc and still hot 10 minutes before they were due to stop serving it at 10:30 am. The location right on Dam Square is perfect, the staff couldn't have been more helpful and I wouldn't hesitate to stay there again.